The Santa Barbara City Council plans to reaffirm its support for the moratorium against further oil leasing or development in the state and federal waters of the Santa Barbara coast this coming Tuesday in an effort to limit the political impact associated with the county supervisors’ 3-2 vote two weeks ago in support of lifting that moratorium. Further goading the council’s anti-oil majority into action was former New York mayor and former presidential hopeful Rudy Giuliani’s in-your-face exclamation of “Drill, baby, drill” during his speech at the Republican convention. Giuliani may have been the most ebulliently outspoken, but Republican presidential nominee John McCain and his vice-presidential running mate Sarah Palin also voiced unequivocal support for expanded offshore drilling. The county supervisors, spearheaded by 3rd District representative Brooks Firestone, voted to send a letter to Governor Arnold Schwarzenegger urging him to support lifting the ban on new oil leasing in state and federal waters. They argued that expanded offshore oil development would help lower the price of gas, would increase the United States energy independence from foreign oil sources, and would generate royalty payments that would help the cash-strapped county financially. Opponents countered that federal studies indicate that the new oil would not be available for about 10 years, at which point it would have minimal if any impact on prices. Likewise, they contended the United States would do better to focus on developing renewable energy sources rather than exhausting the last remnants of the country’s oil reserves. 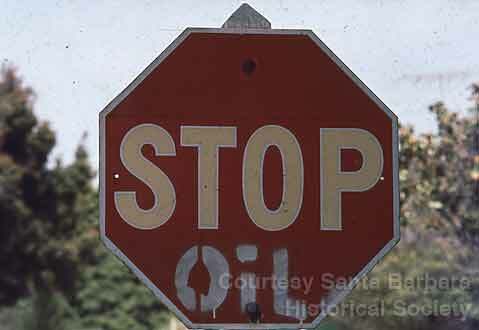 The Wilderness Society argued that if further drilling were the solution, oil prices would not be so high. They noted that the number of rigs in production today is the greatest since 1985. Thus far, Schwarzenegger has argued that the oil moratorium – enacted by former President George Bush in 1989 and by Congress in 1994 – should be maintained. Fifty environmental organizations have applauded Schwarzenegger for his position, though privately, some fear the governor may flip in an effort to maximize revenues from oil royalties. The state is facing a $16 billion budget deficit and the Legislature has already exceeded the record for the most number of days the state has operated without an approved budget. Assemblymember Pedro Nava, the Democrat who represents Santa Barbara, announced that the Legislature approved a resolution affirming the existing moratorium on new leasing and production. All this promises to be foreplay for Tuesday’s showdown between pro- and anti-oil forces, which is scheduled to begin in the City Council chambers at 6 p.m. But mostly, it’s a local manifestation of the wrangling anticipated in Congress next week over energy policy. Republicans have pinned their political stars on increased drilling, and many Democrats – responding to the pain inflicted by high gas prices – are wavering in their opposition. House Speaker Nancy Pelosi has settled upon a strategy to give the Republicans a deal to which they can’t say yes. Pelosi has indicated that she might be willing to consider expanded offshore oil leasing, but only if the Republicans agree to increased funding for a host of alternative energy programs. Those new programs, according to Pelosi, will be paid for by abolishing the $4 billion tax credit Democrats say is now slated to go to the five biggest oil companies. In addition, Pelolsi and the Democrats are insisting that Republicans approve new regulations requiring utility companies to provide a certain percentage of their power by developing renewable energy sources. In years past, the Republicans have vigorously resisted such efforts.